The man from whom "Starlight" stole his identity. 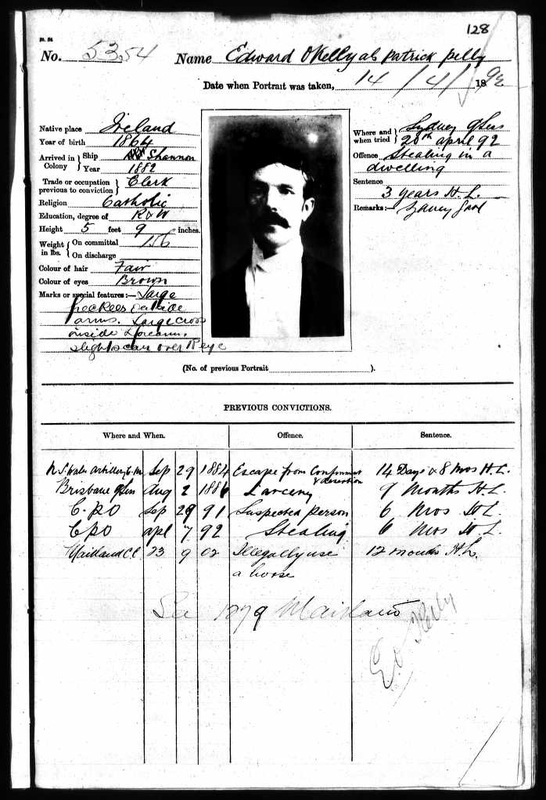 Here is his mug shot from Maitland Gaol in 1902. Captain Starlight met Patrick Edward Pelly when they were both serving sentences in St Helena Gaol in Moreton Bay in 1887/1888. Starlight was under sentence as 'Frank Gordon' at the time. The men found they had much in common - in particular, an interest in literature - and they became firm friends. Pelly saw 'Gordon' as a brother and when his friend asked if he might take his name, Pelly agreed, little knowing that 'Gordon' was in earnest. Pelly also claimed that while in gaol the friends made wills, each naming the other as a beneficiary. When 'Gordon' was released from gaol first, Pelly asked him to take his album of family photographs to his brother, George Kirkaldy Pelly, who Patrick believed was living in Brisbane at the time. 'Gordon' agreed and took the album, though he never delivered it to George. Instead he kept and used it to forge a new identity for himself as 'Major Patrick Francis Pelly'. Patrick Edward Pelly came from Portumna, in County Galway, Ireland. He was born in about 1858 to parents Michael and Honoria. Patrick came from a large and respectable Roman Catholic family. His father was a collector for the Poor Law; he had an aunt who was a nun and a brother who was a priest. He and his siblings were well educated and Patrick was articulate and intelligent. Patrick claimed to have been a journalist but he was rarely out of gaol for long enough to practise his profession. His letters show quite a flair for language, a strong affection for his family and an active - if troubled - conscience. Patrick claimed to have emigrated to Australia on the 'Eastcroft' in 1878. He was in trouble with the law from his very early days in Australia. Family history suggests that he may have been encouraged to emigrate by his family when his poaching activities at home started getting him into trouble. Patrick's criminal record is astonishingly long and remarkably unsuccessful. He was a petty crook, engaging in opportunistic petty thefts and frauds, none of which wer﻿e well planned or cleverly executed. He was neither a violent man nor a schemer and he seems to have been quite personable. Certainly he was gregarious. Patrick was well aware of - and troubled by - his faults; his letters are full of regret, shame and loneliness. Patrick's main problem seems to have been alcoholism; many of his crimes were committed while drunk. He never married, and he died alone in the Rookwood Benevolent asylum: a home for destitute old men. Patrick Edward Pelly in 1896. 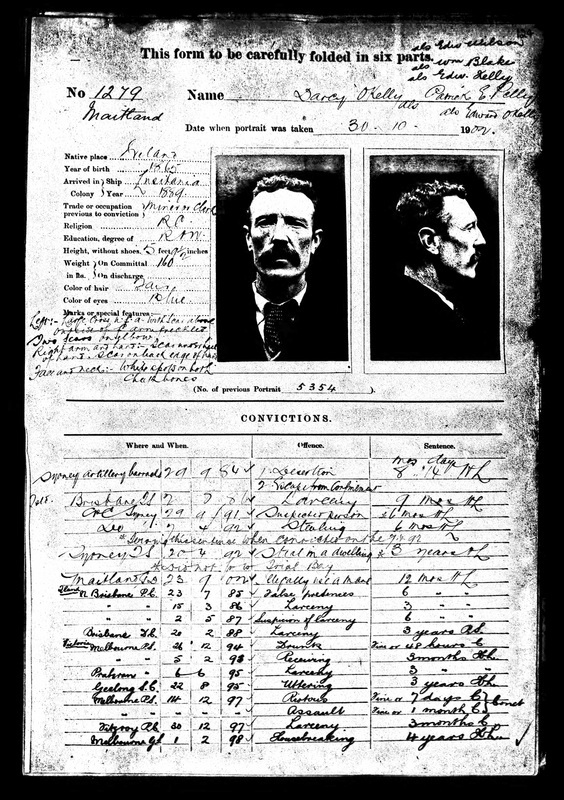 Gaol photograph taken from his gaol entry record. Image courtesy of Public Records Office of Victoria. [VPRS 515, record no 27152]. Click on the image to go to the full gaol record. Patrick Edward Pelly in 1901 (left) and 1897 (right). Gaol photograph taken from his gaol entry record. Image courtesy of Public Records Office of Victoria. [VPRS 515, record no 27152]. Click on the image to go to the full gaol record. 16 April 1879: Conviction for forgery and uttering: sentenced to 9 months. fraudulently obtaining money from J.F. Haike of Brisbane. Remanded to Brisbane. Gaoled at Toowoomba. 7 April 1892: Conviction: Stealing in a dwelling. telegram to Sarah Manusu of Mundooran, with intent to obtain money, on the 17th August. 11 March 1904: Convicted of stealing a waterproof cloak, jacket and skirt from Maie Nelson, of Majeroni Dramatic Company. Tried at Adelaide; sentenced to 6 months imprisonment. Read the story. 20 Oct 1915: Enlisted in the Army at Liverpool, NSW, claiming to be a 49 year old journalist with no criminal past. 31 Dec 1915: Discharged from the Army at his own request. See his military record. Nov 1916: In Orange, NSW: Arrested for not paying for a round of drinks and assaulting the publican. Charges dropped. Read the story. Jan 1919: Convicted but not punished for drunkenness (at Blackall). Read the story. (1881, March 28). New South Wales Police Gazette, p. 105. (1882, March 1). New South Wales Police Gazette, p. 83. (1882, May 31). New South Wales Police Gazette, p. 210. (1884, June 25). New South Wales Police Gazette, p. 270. (1884, Aug 27). New South Wales Police Gazette, p. 358. (1884, Sept 24). New South Wales Police Gazette, p. 398. (1885, July 22). New South Wales Police Gazette, p. 220. (1894, Oct 3). New South Wales Police Gazette, p. 332. (1902, Oct 8). New South Wales Police Gazette, p. 396. (1903, Sept 16). New South Wales Police Gazette, p. 357. (1895, June 5). Victoria Police Gazette, p. 185. (1897, Dec 4). Victoria Police Gazette, p. 3. (1897, Dec 8). Victoria Police Gazette. (1886, Jan 16). Queensland Police Gazette, p. 49. (1886, June 5). Queensland Police Gazette, p. 155. (1887, April 2). Queensland Police Gazette, p. 141. (1887, Nov 5). Queensland Police Gazette, p. 370. (1887, Nov 12). Queensland Police Gazette, p. 373. (1888, March 24). Queensland Police Gazette, p. 137. (1890, Nov 15). Queensland Police Gazette, p. 369. A commercial's stolen coat. (1904, Oct 21). The Register (Adelaide, SA), p. 2. An impudent thief. (1904, Oct 19). Port Pirie Recorder and North Western Mail, p 2. Famous bushranger was clerk in Perth. (1934, August 20). Barrier Miner, p. 2.Police court - Adelaide. (1904, March 15). The Advertiser (Adelaide, SA), p. 9. Port Pirie. (1904, Oct 24). The Advertiser (Adelaide, SA), pp. 8,9. Clerk of the Peace: Registers of Criminal Depositions received: Mar 1880-Nov 1895; Series Number: 849; Reel: 2761. Patrick Edward Pelly, 1882, p.195. VPRS 515, Central Register of Male Prisoners, Sub-item Pelly, Patrick, No. 17267, Page 268. VPRS 515, Central Register of Male Prisoners, Sub-item Pelley, Patrick; (Edwd Kelly); (Edward Wilson); (Wm Blake). No. 27152.